I've been wanting a small greenhouse for a few years now and DH is finally getting on board with it. Are the ones from the big box stores worth it? Or should I lean toward DH building it with 2x4 framing? I'm hesitant on the scratch built one because I don't know what is best to cover it with. Also, what do most people use as a base material. I was thinking 2x2 patio stones. Any suggestions or input would be greatly appreciated, even though it will be spring before we can get one up. On the subject of greenhouses. We need to know where you are located. Please update your profile with your location and zone. The size of the greenhouse really depends on what you are going to use it for. Is it for winter storage, seed starting or for year round use. If you live in a cold climate you need a different kind of greenhouse from those who live in warm climates. Here in hawaii, green houses are usually not made of glass, heated or insulated. It may have R/O water, fans and air conditioning. Roofs can vary from phylon to shade cloth. Most green houses here are really shade houses with shadecloth or mesh sides to let air through a, manage light and water. Keeping bulbuls out, well, that is another problem. How much space you think you need is probably not enough. Greenhouse space fills up fast and you probably have to build it twice as big as you are planning. You may need a building permit for a larger greenhouse. 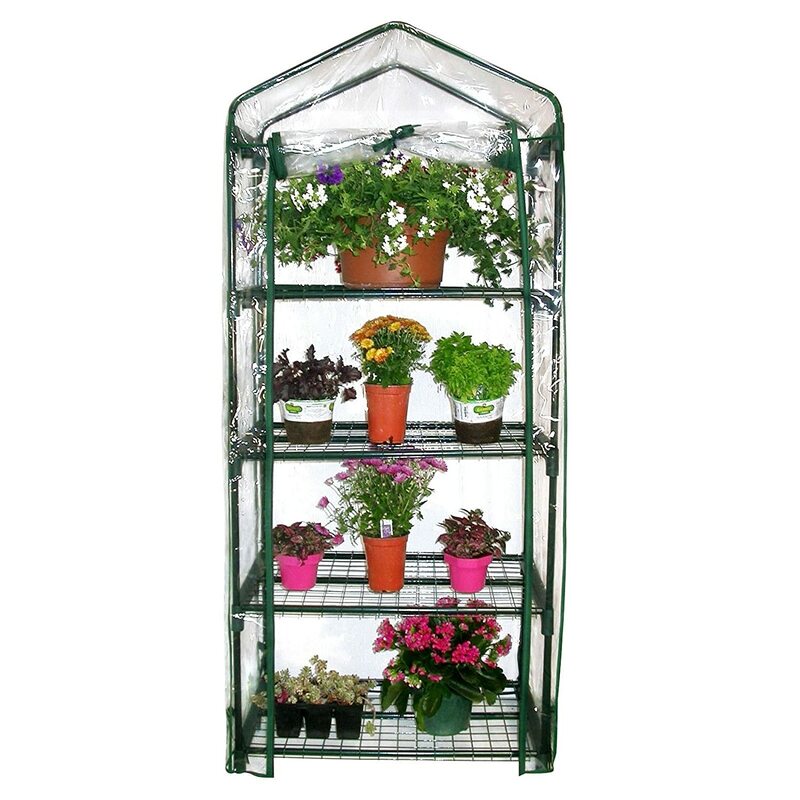 I myself like the A frame type greenhouse since a triangle is the strongest structure and very easy to put up! I would put up a 2 foot frame like in a rectangle like 8 by 12 then start a 2 by 4 by 8 on a angle from eaxh end across the 8 foot width. To make it even better use a 2 by 10 on the south side to get a longer slant and put the 8 foot 2 by 4/s in the back straighter up more like a slanted A! I would get a roll of 6 mill clear plastic roll 100 by 20 from a store like Rural King or Lows for about $70 and have plenty for 2 years or even for a bigger greenhouse. Two layers separated by a few inches is what you need. Now add 4- 50 gallon drums of water to hold the day heat for the night. Without heat the greenhouse will stay above 32 degrees toextend you season a few months and maybe all winter for cole crops or lettuce.! Hope this helps! Sorry about that. I've updated my location now. I'm in zone 5 western Pennsylvania. I want to use the green house for starting seeds and getting a jump on my garden in the spring. During winter it will mainly be storage for all my pots and flats. I might try some cool weather crops in the spring just for fun though. I have a shed type GH that is hooked to the house with fans, timers and thermostats to keep it running most of the year. I have a smaller window box to start my seedlings within the GH to keep them warm in Feb when it is near zero. That said, it's just my way of utilizing free heat and light. I still bring seedlings in and out during cold spells. An independent GH would require much more heat or more attention to temps to prevent damage to seedlings when temps bottom out. If I couldn't make use of the house' residual heat I would grow my seedlings in a controlled atmosphere with adequate heat and light indoors. The window box has heat mats for controlled temp for starting peppers at 80f. The toms, lettuce and brasicas start fine in 50-70 temps. There is supplemental lighting to get them off to a good start in early am and late pm. The GH in full spring mode when temps pick up...on a nice day. Temps can drop out and the tender seedlings need packed inside. Raine wrote: Sorry about that. I've updated my location now. I'm in zone 5 western Pennsylvania. I want to use the green house for starting seeds and getting a jump on my garden in the spring. During winter it will mainly be storage for all my pots and flats. I might try some cool weather crops in the spring just for fun though. I am from western Pa. also and the A frame greenhouse using 2 by 4 its easy and cheap to put up. I just staple the plastic on the boards and usually change it every year since it so cheap! A 8 by 12 greenhouse can be put up for less than $200! Honestly, Raine, if you can find a little bit of space indoors to start your seeds under lights, I really don't see the point of a greenhouse. There's like three weeks in the spring and three weeks in the fall that it's maybe helpful, but as noted unless you are going to heat the greenhouse, you will still have to be bringing lots of plants in when it gets cold. And unless you are going to have lights in it, your seedlings will get a lot more consistency of light with a fluorescent tube right over them on 16 hrs a day. I had a cheap, flimsy greenhouse for awhile, but I ended up getting rid of it. 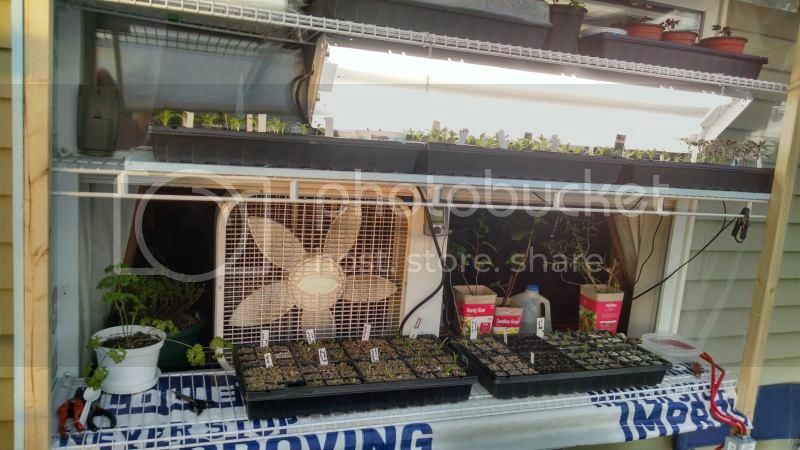 If you have indoor seed starting, you can easily do those cool weather crops. I planted broccoli indoors mid to late Jan. Bring it out to start hardening by beginning of March (which is an in-and-out process for awhile) and plant it in the ground as soon as the ground can be worked, which for me was usually at least a full month earlier than my average last frost date. It was old kitchen cabinets saved from a remodel (but kitchen cabinets can be very cheap) with a wooden counter top across them. Shelves hung from the wall, with shop light fixtures hanging from them. First shelf had lights hanging from it and plants sitting on it. Second shelf had lights hanging from it and just storage on top. And the kitchen cabinets bring everything up to a working height AND provide a ton of storage for all those trays and pots. I had 16 running feet of lights and plants that way in 8' of floor space. If you didn't need that much, you could use 2 foot fluro tubes and have 8 feet of lights and plants in four feet of space. It was four tubes wide (two shop light fixtures) so I could have the 10-x20" trays across the counter, maybe even squeeze 9 of them on an 8 foot counter. My take on greenhouses is either you have a full on professional greenhouse with heat and light and insulation and room to put 50 gallon drums of water for thermal mass or you don't bother. 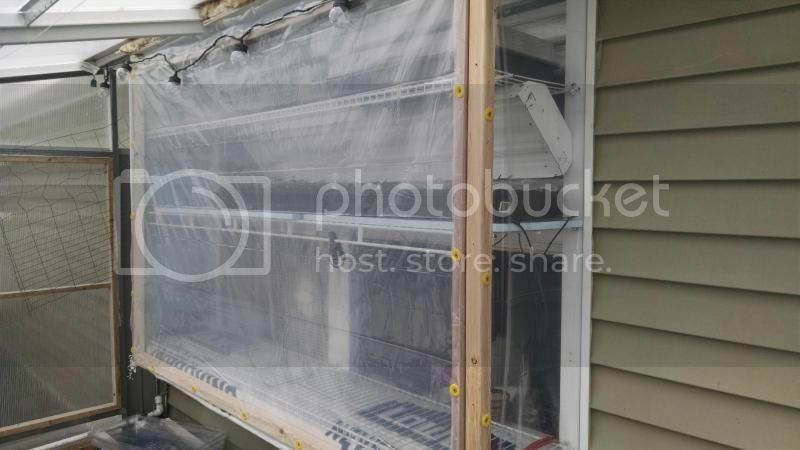 What I did find helpful was just a metal shelving unit wrapped in plastic sitting on my deck, to provide a little extra protection for seedlings just coming out from indoors. but you can get these pretty cheap these days. This winter I may just get myself one. 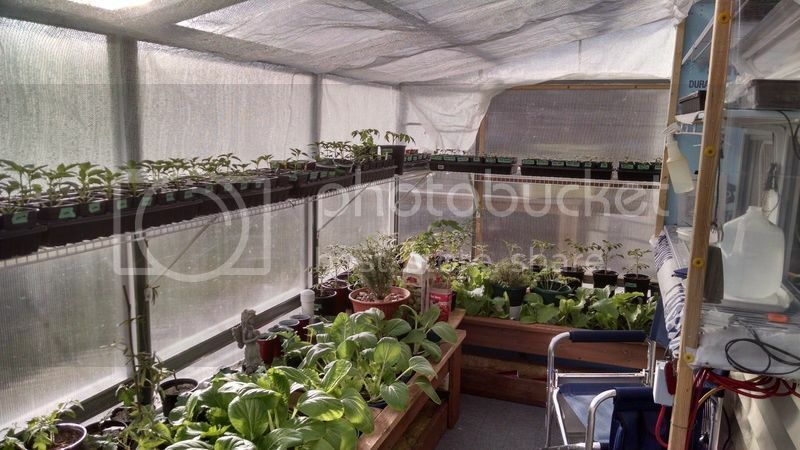 I have an awesome 8x13 greenhouse from WeatherPort. It is on the expensive side but the quality is insane. It is very very very easy to use and I love it.